Since both Trump and Modi excite hearts rather than minds, they ought to be invited to the next Jaipur Literature Festival. A Jaipur Literary Festival audience.Deepak Sharma/Press Association. All rights reserved.It was yet another victory for Trump. The reports of America’s decline are exaggerated. The Jaipur Literature Festival (JLF) proved it. POTUS – President of the United States – matters. Donald Trump got mentioned in several sessions. Hovering as a spectre over a literary festival in a distant land is a great achievement, beyond the President of Mongolia and the Supreme Leader of North Korea. 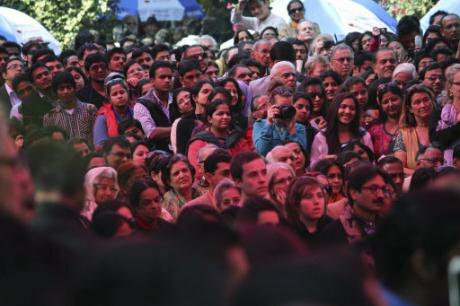 At JLF, all references to Trump were critical and every scathing remark about him was greeted with derisive laughter by the audience. But Trump derives oxygen of publicity from critical comments. These energise his cultish constituency. His fans, like the devotees of all cult heads, are ever ready with an abusive and intimidating response to the leader’s critics. A quick response team goes into battle on the social media. Soon after moving into the White House, Trump phoned the Indian Prime Minister Narendra Modi, a fellow populist leader, and invited him to visit the White House. Trump could hardly complain to Modi against those in Jaipur who misjudged him. They were mainly Americans, Britons and Non Resident Indians. The prominent Indian writers who had retuned their awards protesting against rising intolerance and intimidation of writers and rationalists were not invited to the Jaipur Literature Festival this time but some of those who came pointed a finger at the ills afflicting the contemporary India. A famous poet from the Hindi film world “barked” and celebrated his “freedom to bark”. So what if he cannot bite he said, acknowledging the failure of poetry to influence politics! He knows we are not in the romantic age and poets are no longer unacknowledged legislators of the world. Hovering as a spectre over a literary festival in a distant land is a great achievement, beyond the President of Mongolia and the Supreme Leader of North Korea. The attack on Trump began at the opening session of the festival. 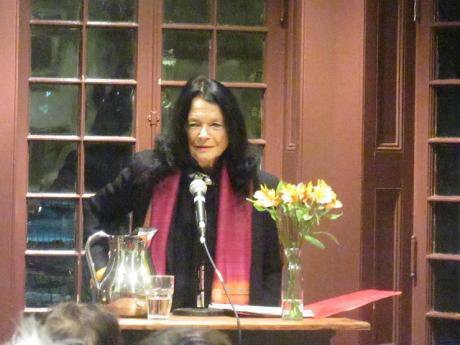 American poet-performer Anne Waldman, in her keynote address, referred to the “terrible inauguration” in Washington DC. She went further than Meryl Streep, shouting in solidarity with her sisters, daughters, children and all women marching towards Washington to protest against the impending inauguration of Trump as President. Anne Waldman reading, 2015. Flickr/kellywritershouse. Some rights reserved.That was just the beginning. Trump kept coming in for dishonourable mention and those making snide remarks included eminent speakers and moderators. A British writer said he would not even utter the name of the new American President. He didn’t have to. The organisers had framed the issue mainly in the context of Trump and Brexit since lies were used in the two campaigns. As the debate progressed, the spectre of Narendra Modi came to haunt it. Since Prime Minister Modi has been blamed for not being truthful while electioneering and while selling his demonetisation decision, his supporters suspect words such “Post-Truth World”. Trump is cited most by those commenting on the post-truth world. Of course, the argument about the rise of passion as the prime instrument of winning power has been validated in the recent years in India, America and Europe. Entering the Jaipur Literary Festival.Manish Swarup/Press Association. All rights reserved.It is said that one can gain more understanding about the human heart from Shakespeare than from Freud. Myron Magnet asks in an essay: "Can anyone think that the studies of Margaret Mead or Alfred Kinsey tell us anything nearly as true as Ovid or Turgenev?" Since both Trump and Modi excite hearts rather than minds, they ought to be invited to the next Jaipur Literature Festival. Modi’s book of poems could be among the scores of books that are released at JLF. 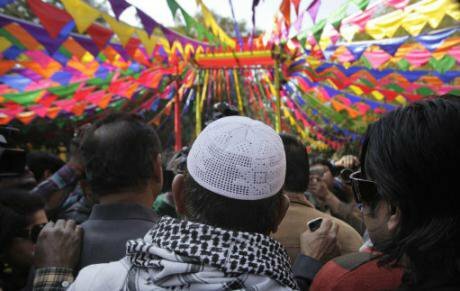 It will fit into JLF’s intellectual agenda since the organisers say that the festival should not just be a bubble in which the liberals talk to liberals. Going by this policy, this time they invited two leaders of the RSS, a right-wing cultural organisation that mentors the ruling party. Modi was groomed by the RSS from a young age. Participation by Trump and Modi will fit into JLF’s commercial agenda also. It will gain significant sponsors as the American Embassy and the Indian Ministry of Finance. If the Modi Government accepts the suggestion made at JLF by a noted TV journalist, it would set up a Ministry for History. That ministry could sponsor presentations by two non-Marxist historians. Like the truth, there is also “My History vs. Your History.” That may be a topic for the next JLF. Rival historians can then come and fight outside the Groves of Academe!